A few simple tips for falling back in love with your home. Windows let in natural light, which makes a home look more welcoming and makes rooms look bigger. By blocking windows with lamps, bookshelves, or furniture, you are unknowingly making the room look smaller. Keep windows open and let the light shine in. One reason why open houses look so appealing is because everything is crisp and clean. Every decoration and piece of furniture looks as if it is in its own reserved space. It is always smart of sell some of your unnecessary items before moving into a new home (after all, it’s a fresh start, right?) and having less clutter will open up space and make rooms look bigger and more pristine. 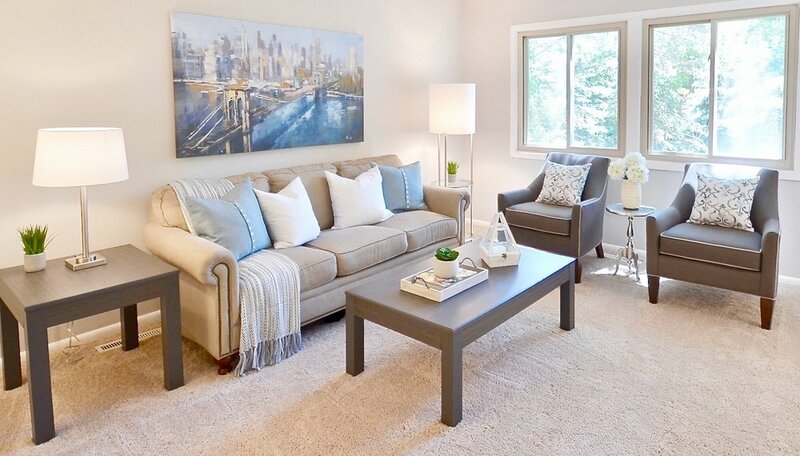 A rule of thumb that home stagers have is to not place anything in the middle of the room. Couches, chairs, and lamps go on the outskirts, coffee tables go in front, and a nice rug can tie the room together in the middle. By angling furniture or placing large items in the middle of the room, you are blocking space and making a room look smaller than it actually is. Photographs, paintings, wall hangings, décor, etc… fill up those walls! Adding decorations makes a house feel more welcoming and lively. Just make sure you don’t make them look too cluttered – a few wall decorations in each room will do the trick in making a house feel more like a home.